At least 17 people have been killed and 30 wounded in an ambush by right-wing Lebanese forces on a bus carrying Palestinians in Beirut. Reports are confused but it appears the Lebanese Phalangist gunmen attacked the bus, killing at least 14 and injuring about 20 more, as it drove through a Christian suburb of Beirut. The trouble began earlier when Palestinian guerrillas, driving jeeps through the district of Ayn-al-Rummanah, reportedly opened fire on the congregation outside a Maronite Christian church. Christian Phalangist leader, Pierre Gemayel, was attending Mass at the church and his Phalangist supporters on guard outside seized one of the jeeps and a scuffle broke out. Tension has been running high following the attempted kidnapping of Amin Gemayel, the son of Pierre Gemayel, leader of the most influential Christian group. Pierre Gemayel founded the Phalangist militia to protect the Maronite Christian community, which has dominated Lebanese politics and leadership of the army since the formation of Greater Lebanon in 1920. But the Christians have faced increasing resentment from the various Muslim groups, who have grown rapidly in numbers, but remain under-represented by the government. Feelings among the Christians have been exacerbated by the arrival of Palestinian refugees, who have set up their headquarters under the leadership of Yasser Arafat in Beirut. The leader of the Palestine Liberation Organisation has tonight called on Arab nations to exert pressure on Lebanon to punish the Phalangists. 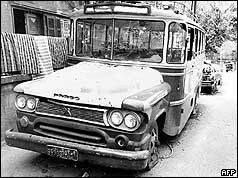 He sent a telegramme accusing the Phalangists of ambushing a civilian bus, killing many of its passengers including women and children. The final number of dead was 26. The clash marked the beginning of 15 years of civil war in Lebanon. The Maronite Christian groups, led by Shaikh Pierre Gemayel's Phalangists, had the backing of Israel, while the Muslim militias were mainly supported by Syria. However, allegiances often switched and Syria's invasion in 1976 helped the Christian Maronites. From 1978 Israel occupied a southern border or "security zone". Then in 1982 it launched a full-scaled invasion, which led to the siege of Beirut. The Syrians were forced to withdraw and the PLO moved its headquarters to Tunisia. Following heavy losses, Israel ultimately withdrew in 1984, leaving the rival factions to fight it out among themselves. The Taif Accord or Charter for National Reconciliation held out the prospect for constitutional reform in 1989. It was only with the world focus switching to the Gulf states in the build-up to the war that Syria was able to re-occupy Lebanon and enforce the accord which guaranteed equal representation for the Muslim communities. There have been growing calls for the Syrian forces to leave Lebanon since the assassination in Beirut in 2005 of former prime minister Rafiq Hariri.